Crews try to contain gas leak in San Francisco's Hunters Point Neighborhood (Oct. 19, 2016). 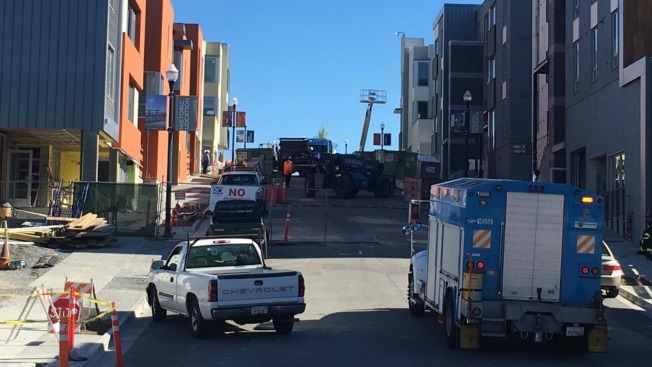 A four-inch natural gas main in San Francisco was ruptured by a contractor Wednesday afternoon, prompting roughly 20 people to be evacuated. The gas leak occurred in the Hunters Point neighborhood and San Francisco Fire Department spokesperson Jonathan Baxter says that Pacific Gas and Electric Company hopes to have the leak capped by 3:30 p.m. Residents living in the 400 and 500 blocks of Innes Ave. have been evacuated and are currently waiting to be sheltered inside a city bus, Baxter said. No injuries have been reported, according to officials. Most of the neighborhood, which resides near the old San Francisco Naval Shipyard, is currently under construction, but there are a few people who currently live in completed homes.